GORDONVILLE – A lot of writer types spend Father’s Day looking at the past, with dear-old-dad yarns, and I have done my share of that as well. That is particularly true in more recent years. My father died in 2008, father-in-law in 2010 and stepfather in 2011. But I feel myself pulled by a force keeping me in the present, and focused on the future. That force is the greatest of all: My daughter, Sofia, and my love for her. Last Father’s Day, I suppose I was still in a state of semi-shock, having recently joined the ranks of the unemployed and trying to find my footing in a New World Order. Priority No. 1 was simply to make up for lost time with Sofia. As it was, I was seeing her for a grand total of 45 minutes a day – including 10 to 15 minutes of just watching her sleep, kissing her cheek and stroking her hair – when I would return home from the salt mines well after she ventured off to Dreamland. In the time since, I have completely wrapped my arms around the role of stay-at-home dad. Ironically, I have been able to do this while doing twice as much writing – not to mention different types of putting pen to paper (actually fingers to keyboard, as old-fashioned writing actually give me hand cramps) – as I did when employed by a newspaper. It is the best of both worlds, because no writer’s soul is complete without love. I know it sounds corny – even in a John Lennon kind of a way – but Sofia turns me to a bowl of mush. I have always loved her so much that it often hurts. For those of you who thought I would grow weary of driving her to and from school and her myriad of diverse activities – not to mention play dates, negotiated pit stops for snacks, monitoring homework progress, brushing her hair and giving allergy pills – keep on thinking. It has been the best time of my life. When Sofia was born, I professed pleasure that she was a girl. It was not just a cover story, as I felt being a daddy to a little girl was easy. Just let her be “daddy’s little girl” and let the chips fall where they may. A boy? With me? The sports pressure might have reared its head. No, I wouldn’t have made a theoretical mini-G2 do anything against his will, but I would have made him try – and keep trying – before waving the white flag. I know that sports are how boys are defined, and how they define themselves. Without sports, I know I would not have had some modicum of self-esteem. I would have wanted the same for him, but surely would have relented if it was there without it. With a girl, in these times, the whole playing field is open. Dance, music, art … you name it, you got it. Sofia started with dance lessons two years ago. Sports dabbling started last spring with coach-pitch baseball. She was one of only two girls on her team. She wasn’t very good, but she always kept a good attitude and a smile on her face. She tearfully confessed last summer that she wanted to learn how to do a cartwheel like some of the girls in her dance class, so we signed her up for gymnastics. She will never be on the platform of the Olympics hearing the national anthem, but she has gotten 100 percent since she first walked into the Little Gym of Spring House last summer. She enjoys it so much that we had her birthday party there, and any suggestion of crossing it off of her hectic agenda gets met with protest that would make Abbie Hoffman proud. Although my wife sees it differently, Sofia had no qualms about moving on to play Rookie Softball this spring. It was all girls, which was a plus. I was told it was “exactly the same” as last year, but with girls and a softball, so I was comfortable with the format. No more boys saying stuff like: “Why do we have to have girls on our team?” (“Why do we have to have boys on our team?” Sofia snorkeled back.). But there were some discernible differences. These girls, mostly in second grade (Sofia and a few others were in first), could play much better than the kindergarten and first-grade boys in coach-pitch. And unlike coach-pitch were strike outs. Not after three pitches, but you still had to humbly take a seat after swinging and missing too much in an at-bat (the amount of times varied, depending on variables like the number of kids there and how much time was left in the game). The first two games, after some spring training in the backyard, Sofia put the ball in play in seven at-bats. I’d like to say they were tape-measure shots, but you would probably only need a ruler to measure how far they traveled. But she was happy. And I was happy to see her happy. And then, fateful game No. 3. Cruella De Vil’s evil twin, coaching for the team from Plymouth Township, insisted on strikeouts after five swings. Sofia had a rough day, striking out four out of five times. The next game, the struggles continued and the confidence began to wane. That was on a Saturday of a weekend I had her alone (her mommy left town for a girls-only weekend and I was gleefully tasked with “daddying” her up). I don’t know if the slump bothered her as much as it bothered me, but she seemed more than willing to go the next day for some swings in the batting cage at Freddy Hill Farms. We went to what we were told was the slowest machine, but the ball came out pretty fast. Before she was ready, she got beaned in the thigh. She started to cry and wanted to go home. I explained to her that she had to stay in the batter’s box and she wouldn’t get hit. After some coaxing, she got back in. I told her she didn’t have to hit the ball, since it was going so fast, but to just give me good level swings. Lo and behold, she hit the ball a few times. And then, it struck her in the hand. She was legitimately injured, with a formidable bruise on her thumb. I got some first-aid stuff from the staff and we sat on the bench near the cage while she cried it out (giving me a chance to hold her tight, which was my lemonade out of the lemons). Meanwhile, a young lady in North Penn High softball attire stepped into the same cage and began working on her swing. I told Sofia to watch how she batted, but Sofia was quick to point out that she was older and could handle the faster pitching. And it struck me — as if I had been beaned — that I was bordering on being guilty of treating Sofia how I would a boy. I needed to reel myself in. 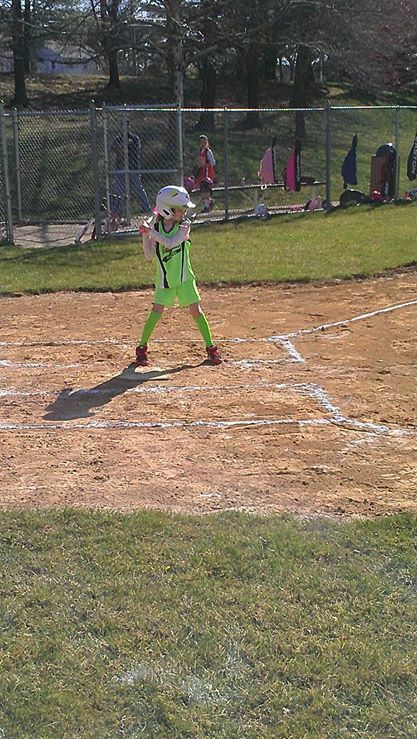 She thought softball was fun, and didn’t seemed too bothered with her slump (she is more into being a fashionista on the field, making sure her headband and sunglasses matched the lime-green uniform). We played two rounds of miniature gold, got some ice cream and didn’t talk softball. Three days later, we were back at the field. My job — as a low-level assistant — was to keep the scorebook and make sure the girls stayed in their predetermined batting order, had their helmets on and didn’t swing their bats until they were in the on-deck cage. As fate would have it, Sofia was batting first that game and was at the plate before I could even say anything. They gave her well more than five swings, but she struck out anyway. Things were more settled before the second at-bat, so I called her over and channeled my inner Mike Brady (dad on “The Brady Bunch”). “If you do your best, honey, it’s the best you can do, so just do your best,” I said. The look on her face was worth the 6,000 cutie-pie pictures I take — and post to Facebook at an obnoxious rate – on a per-week basis. It was like a cloud had been lifted. And she hit the ball. And she kept on hitting it – sometimes so far that you could measure the distance with a yardstick – for the rest of the season. She started showing more confidence in the field, being a sure bet on soft grounders in her zip code while knowing which base to go with the ball (even with an arm almost as bad as Ben Revere’s). She played all the positions. I thought she was best at second base, but she seemed to get a kick out of catcher after I told her that I played there (I actually played more first, but I want no part of her playing there for now). The softball season, which was pretty much our activity together, was probably as much of a learning experience for me as it was for her. All I want her to do – no matter the endeavor — is her best. And I promise I will do the same. In the present, and in the future. This entry was posted in Parenthood, Slice of Life on June 15, 2014 by gordonglantz. Nicely done Gordo. You hit this one out of the park on Father’s Day.